Run Time: 125min Rated: PG (Canada), Rated PG(MPAA) for thematic elements, fantasy action and peril, and some suggestive material. Rob Marshall's adaptation of the Tony award winning musical Into The Woods(1986) is Disney's most recent foray into live-action film musicals. 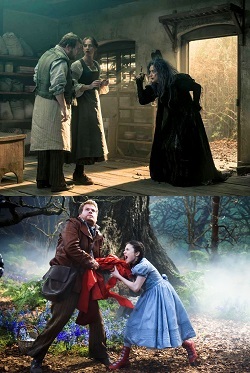 As in the James Lapine musical, with lyrics by Stephen Sondheim, Marshall's Into the Woods (2014) finds its story centred on folk tale characters made popular by the Brothers Grimm. 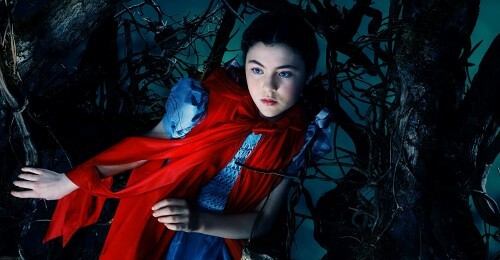 Viewers will see everyone from Cinderella (Anna Kendrick) to Rapunzel (Mackenzie Mauzy), Little Red Riding Hood (Lilla Crawford) to Jack (Daniel Huttlestone) of Beanstalk fame, up on the big screen in a plot that both weaves their stories together and plays their respective stories against each other. Add a baker (James Corden) and his barren wife (Emily Blunt) to the mash-up of those beloved fairy tale characters, add a cursed witch (Meryl Streep) alongside Red Riding Hood's wolf (Johnny Depp) and viewers have a lot to sink their teeth into. However, viewers may want to take the self-aware story's caution to heart and be "careful" when embracing the tale Into the Woods tells. Disney knows a thing or two about musicals having made cartoons and movies containing songs that have permeated the general culture and enthralled children for years. Most people will recognize everything from the cheerful tune of "Whistle While You Work" in Snow White (1937) to the melodic "Let it Go" from Frozen (2014) and they will also recognize how easily their children pick up the lyrics. While it's wonderful to see children genuinely excited about music, parents may want to consider the messages in the words. In the case of Into The Woods the Sondheim lyrics are a product of their times. They are rooted in a post-modern ambivalence and hostility towards normative truths. The film’s overall plot involves a baker and his wife who can't conceive a child. Their next-door neighbour is a witch who was cursed by her own mother. The witch employs the services of the baker and his wife to help lift her mother's curse and in return she'll lift the curse causing the baker's wife's barrenness. All the other fairytale storylines criss-cross each other while interacting with this central plot line. To add drama to the first half of the film the witch needs Cinderella's slipper, Jack's cow "Milky White," and Red Riding Hood’s scarlet hood, among other things, to lift her curse but she can't physically touch them. Hence, the need for the Baker and his wife to gather the goods. "People make mistakes, holding to their own, thinking their alone. Honour their mistakes. Fight for their mistakes everyone makes one another's terrible mistakes. Witches can be right, Giants can be good. You decide what's right, you decide what's good." For Christians familiar with the Ten Commandments this will be a troubling "moral" to the story as God is the true arbiter of what is right and good not the individual. (It would also be troubling to hear children run around the house singing those lyrics.) To a Christian ear those words ring false. "Careful before you say, 'listen to me.' Children will listen. Careful the wish you make, wishes are children. Careful the path they take wishes come true, not free. Careful the spell you cast, not just on children. Sometimes the spell may last past what you can see and turn against you. Careful the tale you tell. That is the spell. Children will listen." Set aside all the “wish” and “spell” language and you’re left with the film's main post-modern thesis: "What has been historically taught to children is not necessarily good and should be placed under suspicious scrutiny ... and whatever is taught to children will have consequences and the teacher will be on the hook for it in the end whether the outcome is for good or for ill, so be careful." Interestingly, the second part of the idea actually resonates well with Christian thought; teachers, parents, grandparents and friends do need to be careful about what they teach, say, and do because children are in fact listening and learning. Jesus warns His disciples, teachers in the church, saying, “Temptations to sin are sure to come, but woe to the one through whom they come! It would be better for him if a millstone were hung around his neck and he were cast into the sea than that he should cause one of these little ones to sin." Turning on its head what Scripture teaches as good and right is clearly to be avoided with everyone, especially when dealing with children or those who, like children, are new in the faith. So do viewers go into the woods with this film or stay at home? While rated PG this film is not suitable for young viewers. Like the original folk tales compiled by the Brothers Grimm Into The Woods ventures into some disturbing and dark subject matter including the rather gruesome comeuppance of Cinderella's stepsisters (Tammy Blanchard and Lucy Punch), and some not-so-subtle innuendo in the story of Little Red Riding Hood and the wolf. That being said, teenaged viewers and adult audiences will find some interesting things to consider. When viewed through the lens of the Ten Commandments the film becomes a cautionary tale focused on the Second Table of the Commandments. Viewers can ask, "Does Prince Charming lead a sexually pure and decent life in what he says and does?" "Does Jack protect his neighbour the Giant's possessions?" "Does Little Red Riding Hood obey her mother's advice about staying on the path in the woods?" When asking these kind of follow up questions keep in mind what the LORD says in Deuteronomy after giving the Ten Commandments: "These words that I command you today shall be on your heart. You shall teach them diligently to your children, and shall talk of them when you sit in your house, and when you walk by the way, and when you lie down, and when you rise." Into the Woods provides ample opportunity to talk about the Second Table of the Ten Commandments and learn from them: first as applied to the film itself and from there to more real-world examples which are sure to naturally flow out of any such discussion. Will little children be singing the lyrics and songs of Into the Woods like they sing those from Frozen? That remains to be seen. While it's making good money at the book office it may not be as musically interesting to young viewers as previous Disney offerings. Still, the film is well cast and the performances have some real stand-out moments. Fair warning: if musicals and musical theatre are not appealing, Into the Woods may well be a special kind of agony but if you are planning to see this film be careful in the woods and don't forget to pack Luther's Small Catechism. This review is also available at the Canadian Lutheran on-line.